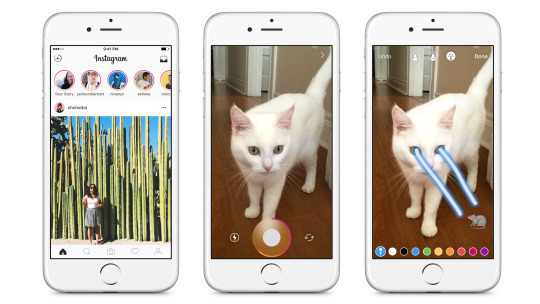 Instagram today announced the launch of a new feature called "Instagram Stories," which lets its users post customized images and videos onto their profile, abiding by the ephemeral rule of rival service Snapchat: every post disappears completely within 24 hours. The company said that this lets users not have to "worry about overposting" and clogging up their profile in the process. Stories will appear in a bar at the top of each user's normal Instagram feed, updating with new posts of all the same friends, family members, and popular accounts they follow. Each time someone posts a new picture or video within their Story, a colorful ring circles their profile picture. Jumping into Stories is as easy as tapping on one of those profile photos, and swiping to move back and forward through each user slideshow. Comments are allowed on Stories, but are only able to be sent through Instagram's direct message feature, because "unlike regular posts, there are no likes or public comments." Keeping in the vein of Snapchat, you can swipe up on your own story to see every Instagram member who has viewed the post so far. To add a bit of flair to a profile, users can also post specific Stories to their page if they decide they want to keep the photo or video longer than 24 hours. Meh, no thanks. I already use Snapchat to post silly/funny images or videos to my story. I'd prefer to keep Instagram with images that I shoot, then edit using the various apps on my iPhone before posting to IG. One app to post to my "story" is more than enough for me. But can you make your cat shoot freaking laser beams out of its eyes? I miss the "good old days" when an app did one thing and did it well. If you wanted to do something else, then you downloaded a different app. Nowadays, everything has to be a features smorgasbord in order to steal users and revenue from each other. Did Instagram just become Samsung? I don't get this new obsession with stuff that vanishes forever. Do we not want to save cool things to look back on them later anymore? Nostalgia is a wonderful feeling; I love finding stuff I posted online 15 years ago. If I'd been using Snapchat like services back then, there would be nothing! Next up: swipe left or right if you like the story. If you like it, a dating profile pops up for quick contact. Wow. Now that's just annoying. i remember when instagram implemented videos and killed vine. true story. Snapchat turned down Facebook's $3,000,000,000 offer to buy them out. Now Facebook is planning to destroy them. Will Facebook fail to capture their market because they're no longer cool with the kids? Will the founders of Snapchat regret their greed since they have problems monetizing their platform? Find out next year on DOES ANYBODY ACTUALLY CARE. I guess some people will care for about 24 hours, and then the caring will disappear altogether. Nostalgia is a wonderful feeling; I love finding stuff I posted online 15 years ago. Boy I'd love to utterly destroy every one of my stupid comments and hormonal ramblings from the face of history.